Shopping for Food and beverages and provisions is one of the most important issues in private yacht charter concept without a doubt The food served on board is the highlight of the day. 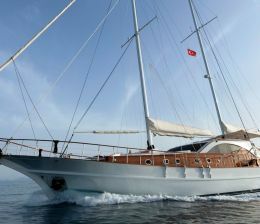 imagine you are on board of a splendid yacht and what if the food and beverages are terrible…! A terrible chef or lack of quality provisions would ruin your holiday. otherwise, You might very well decide to go for food and beverages shopping upon your arrival with our chef and assure that the you buy everything at your hearts content, according to your own taste. the shopping might take a few hours and we want to make sure that you have delicious food and beverages on board to share with your loved ones. Variety of freshly prepared gourmet wraps including Asian Wrap (chicken teriyaki with mustard sauce, fresh tomatoes & lettuce), All-American Wrap (roasted turkey, Swiss cheese, lettuce and tomato), Mexican Wrap (beef fajitas, tomato & salsa), fresh tropical fruit salad, fresh baked cookies & brownies. Antipasto Salad-Steamed asparagus, steamed broccoli, roasted peppers, cherry tomatoes. Pasta Salad- Penne pasta with fresh pesto & parmesan. Fresh baked cookies & brownies. Waldorf Pasta with grilled chicken strips & apples. Choice of potato salad or cole slaw salad. Fresh baked cookies and brownies. Barbecue Grill Options: Enjoy the option of barbecue grilled right onboard our catamarans. Variety of freshly cooked hot dogs, hamburgers and chicken served with assorted bread & buns, fresh fruit salad and fresh baked cookies & brownies. Variety of freshly cooked hot dogs, hamburgers, chicken & churasco steak served with assorted bread & buns, fresh fruit salad and fresh baked cookies & brownies. For those who travel in culinary pursuits, the Turkish Cuisine is a very curious one. The variety of dishes that make up the Cuisine, the ways they all come together in feast-like meals, and the evident intricacy of each craft offer enough material for life-long study and enjoyment. It is not easy to discern a basic element or a single dominant feature, like the Italian “pasta” or the French “sauce”. Whether in a humble home, at a famous restaurant, or at a dinner in a Bey’s mansion, familiar patterns of this rich and diverse Cuisine are always present. It is a rare art which satisfies your senses while reconfirming the higher order of society, community and culture. A practical-minded child watching Mother cook “cabbage dolma” on a lazy, gray winter day is bound to wonder: who on earth discovered this peculiar combination of sauteed rice, pine-nuts, currants, spices, herbs and all tightly wrapped in translucent leaves of cabbage all exactly half an inch thick and stacked-up on an oval serving plate decorated with lemon wedges? How was it possible to transform this humble vegetable to such heights of fashion and delicacy with so few additional ingredients? And, how can such a yummy dish possibly also be good for one? The modern mind, in a moment of contemplation, has similar thoughts upon entering a modest sweets shop in Turkey where “baklava” is the generic cousin of a dozen or so sophisticated sweet pastries with names like: twisted turban, sultan, saray (palace), lady’s navel, nightingale’s nest… The same experience awaits you at a “muhallebi” (pudding shop) with a dozen different types of milk puddings. One can only conclude that the evolution of this glorious Cuisine was not an accident. Similar to other grand Cuisines of the world, it is a result of the combination of three key elements. A nurturing environment is irreplaceable. Turkey is known for an abundance and diversity of foodstuff due to its rich flora, fauna and regional differentiation. And the legacy of an Imperial Kitchen is inescapable. Hundreds of cooks specializing in different types of dishes, all eager to please the royal palate, no doubt had their influence in perfecting the Cuisine as we know it today. The Palace Kitchen, supported by a complex social organization, a vibrant urban life, specialization of labor, trade, and total control of the Spice Road, reflected the culmination of wealth and the flourishing of culture in the capital of a mighty Empire. And the influence of the longevity of social organization should not be taken lightly either. The Turkish State of Anatolia is a millennium old and so, naturally, is the Cuisine. Time is of the essence; as Ibn’i Haldun wrote, “the religion of the King, in time, becomes that of the People”, which also holds for the King’s food. Thus, the reign of the Ottoman Dynasty during 600 years, and a seamless cultural transition into the present day of modern Turkey, led to the evolution of a grand Cuisine through differentiation, refinement and perfection of dishes, as well as their sequence and combination of the meals. Early historical documents show that the basic structure of the Turkish Cuisine was already established during the Nomadic Period and in the first settled Turkish States of Asia. Culinary attitudes towards meat, dairy, vegetables and grains that characterized this early period still make up the core of Turkish Cuisine . Turks cultivated wheat and used it liberally in several types of leavened and unleavened breads baked in clay ovens, on the griddle, or buried in ember. “Manti” (dumpling), and “bugra” (attributed to Bugra Khan of Turkestan, the ancestor of “börek” or dough with fillings), were already among the much-coveted dishes at this time. Stuffing the pasta, as well as all kinds of vegetables, was also common practice, and still is, as evidenced by dozens of different types of “dolma”. Skewering meat as well as other ways of grilling, later known to us as varieties of “kebap” and dairy products such as cheeses and yogurt were convenient and staple foods of the pastoral Turks. They introduced these attitudes and practices to Anatolia in the 11th century. In return they were introduced to rice, the fruits and the vegetables native to the Region, and the hundreds varieties of fish in the three seas surrounding the Anatolian Peninsula. These new and wonderful ingredients were assimilated into the basic Cuisine in the millennia that followed. Anatolia is a Region coined as the “bread basket of the world”. Turkey, even now, is one of the seven countries in the world which produces enough food to feed everyone and then some to export. The Turkish landscape encompasses such a wide variety of geographic zones, that for every two to four hours of driving, you will find yourself in a different zone with all the accompanying changes in scenery, temperature, altitude, humidity, vegetation and weather conditions. The Turkish landscape has the combined characteristics of the three old continents of the world : Europe, Africa and Asia, and an ecological diversity surpassing any other place along the 40th latitude. Thus, the diversity of the Cuisine has come to reflect that of the landscape and its regional variations. In the Eastern Region, you will encounter the rugged, snow-capped mountains where the winters are long and cold, and the highlands where the spring season with its rich wild flowers and rushing creeks extends into the long and cool summer. Livestock farming is prevalent. Butter, yogurt, cheeses, honey, meat and cereals are the local food. Long winters are best endured with the help of yogurt soup and meatballs flavored with aromatic herbs found in the mountains, and endless servings of tea. The heartland is dry steppes with rolling hills, endless stretches of wheat fields and barren bedrock that takes on the most incredible shades of gold, violet, cool and warm grays, as the sun travels the sky. Ancient cities were located on the trade routes with lush cultivated orchards and gardens. Among these, Konya, the capital of the Seljuk Empire (the first Turkish State in Anatolia), distinguished itself as the center of a culture that attracted scholars, mystics, and poets from throughout the world during the 13th century. The lavish Cuisine that is enjoyed in Konya today, with its clay-oven (tandir) kebaps, böreks, mcat and vegetable dishes and helva desserts, dates back to the feasts given by Sultan Alaaddin Keykubad in 1237 A.D. Towards the west, one eventually reaches warm, fertile valleys between cultivated mountainsides, and the lace-like shores of the Aegean where nature is friendly and life has always been easy. Fruits and vegetables of all kinds are abundant, including the best of all sea food! Here, olive oil becomes a staple and is used both in hot and cold dishes. The temperature zone of the Black Sea Coast, well-protected by the high Caucasian Mountains, is abundant with hazelnuts, corn and tea. The Black Sea people are fishermen and identify themselves with their ecological companion, the shimmering “hamsi”, a small fish similar to anchovy. There are at least forty different dishes made with hamsi! Many poems, anecdotes and folk dances are inspired by this delicious fish. 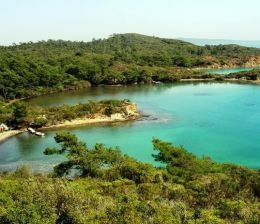 The south-eastern part of Turkey is hot and desert-like and offers the greatest variety of kebabs and sweet pastries. Dishes here are more spicy compared to all other regions, possibly to retard spoilage in hot weather, or as the navites say, to equalize the heat inside the body to that of the outside! The culinary centre of the country is the Marmara Region which includes Thrace, with Istanbul as its Queen City. This temperate, fertile Region boasts a wide variety of fruits, vegetables, and the most delicately flavored lamb. The variety of fish that travel the Bosphorus surpasses those in other seas. The importance of culinary art for the Ottoman Sultans is evident to every visitor of Topkapì Palace. The huge kitchens were housed in several buildings under ten domes. By the 17th century, some thirteen hundred kitchen staff were housed in the Palace. Hundreds of cooks, specializing in different categories of dishes such as soups, pilafs, kebaps, vegetables, fish, breads, pastries, candy and helva, syrup and jams and beverages, fed as much as ten thousand people a day, and in addition, sent trays of food to others in the City as a royal favor. The importance of food has been also evident in the structure of the Ottoman military elite, the Janissaries. The commanders of the main divisions were known as the Soupmen, other high ranking officers were the Chief Cook, Scullion, Baker, and Pancake Maker, though their function had little to do with these titles. The huge cauldron used to make pilaf had a special symbolic significance for the Janissaries, as the central focus of each division. The kitchen was also the centre of politics, for whenever the Janissaries demanded a change in the Sultan’s Cabinet, or the head of a grand vizier, they would overturn their pilaf cauldron. “Overturning the couldron,” is an expression still used today to indicate a rebellion in the ranks. It was in this environment that hundreds of the Sultans’ chefs, who dedicated their lives to their profession, developed and perfected the dishes of the Turkish Cuisine, which was then adopted by the kitchens of the provinces ranging from the Balkans to Southern Russia, reaching Northern Africa. Istanbul was the capital of the world and had all the prestige, so that its ways were imitated. At the same time, it was supported by an enormous organization and infrastructure which enabled all the treasures of the world to flow into it. The provinces of the vast Empire were integrated by a system of trade routes with refreshing caravanserais for the weary merchants and security forces. The Spice Road, the most important factor in culinary history, was under the full control of the Sultan. Only the best ingredients were allowed to be traded under the strict standards established by the courts. Guilds played an important role in the development and sustenance of the Cuisine. These included the hunters, the fishermen, the cooks, the kebab cooks, bakers, butchers, cheese makers and yogurt merchants, pastry chefs, pickle makers and sausage merchants. All of the principal trades were believed to be sacred, and each guild traced its patronage to the Prophets and Saints. The guilds prevailed in pricing and quality control. They displayed their products and talents in spectacular floats driven through Istanbul streets during special occasions, such as the circumcision festivities for the Crown Prince or religious holidays. Before describing each of these categories, some general comments are necessary. The foundation of the Cuisine is based on grains (rice and wheat) and vegetables. Each category of dishes contains only one or two types of main ingredients. Turks are purists in their culinary taste; the dishes are supposed to bring out the flavour of the main ingredient rather than hiding it behind sauces or spices. Thus, the eggplant should taste like eggplant, lamb like lamb, pumpkin like pumpkin. Contrary to the prevalent Western impression of Turkish food , spices and herbs are used with zucchini, parsley with eggplant, a few cloves of garlic has its place in some cold vegetable dishes, cumin is sprinkled over red lentil soup or mixed in ground meat when making “köfte”. Lemon and yogurt are used to complement both meat and vegetable dishes, to balance the taste of olive oil or meat. Most desserts and fruit dishes do not call for any spices. So their flavours are refined and subtle. There are major classes of meatless dishes. When meat is used, it is used sparingly. Even with the meat kebabs, the “pide” or the flat bread occupies the largest part of the portion along with vegetables or yogurt. The Turkish Cuisine also boasts a variety of authentic contributions in the desserts and beverage categories. For the Turks, the setting is as important as the food itself. Therefore, food-related places need to be surveyed, as well as the dishes and the eating-protocol. Among the “great-good places” where you can find the ingredients for the Cuisine, are the weekly neighbourhood markets- “pazar”, and the permanent markets. The most famous one of the latter type is the Spice Market in Istanbul. This is a place where every conceivable type of food item can be found, as it has always been since pre-Ottoman times. This is a truly exotic place, with hundreds of scents rising from stalls located within an ancient domed building, which was the terminal for the Spice Road. More modest markets can be found in every city centre, with permanent stalls of fish and veegetables. The weekly markets are where sleepy neighbourhoods come to life, with the villagers setting up their stalls before dawn at a designated area, to sell their produucts. These days, handicrafts, textiles, glassware and other household items are also among the displays at the most affordable prices. What makes these places unique is the cacophony of sights, smells, sounds and activity, as well as the high quality of fresh food, which can only be obtained in the pazar. There is a lot of haggling and jostling, as people make their way through the narrow isles while the vendors compete for attention. One way to purify body and soul would be to rent an inexpensive flat by the seaside for a month every year, and live on fresh fruit and vegetables from the “pazar”. However, since the more likely scenario willbe restaurant-hopping, here are some tips to learn the proper terminology so that you can navigate through both, the Cuisine (just in case you get the urge to cook a la Turca), and the streets of Turkish cities, where it is just as important to locate the eating places as the museums and the archaeological wonders. The foundation of Turkish food is, if anything, the dough made of wheat flour. Besides “ekmek” – the ordinary white bread, “pide” – flat bread, “simit” – sesame seed rings, “manti” – dumplings, a whole family of food made up thin sheets of pastry called “börek” falls into this category. The bakers of the Ottoman period believed that Adam, the Patron Saint of Bakers, learned how to make bread from the Archangel Gabriel, after his expulsion from the Garden of Eden. Obviously, the secret is still held dearly by the present day Turkish bakers, no other bread tastes as good as the even the everyday Turkish bread. One realizes the wonderful luxury of the Turkish bread upon leaving the country. This blessed food is enjoyed in large quantities and is respected by all, rich and poor, simple and sophisticated. Every neighbourhood has a bread-bakery that produces the golden crisp loaves twice a day, morning and afternoon, filling the streets with their irresistable and wholesome aroma. People piick up a few loaves on their way home from work, and end up eating the crisp ends by the time they get there. After a hard day’s work, holding the warm loaf is the best reward, convincing one that all is well. Ekmek, pide and simit are meant to be eaten the same day they are baked, and they usually are. The leftover ekmek goes into a variety of dishes, becomes chicken feed, or is mixed with milk for the neighbourhood cats. Manti, dumplings of dough filled with a special met mix, are eaten with generous servings of garlic yogurt and a dash of melted butter with paprika. This is a meal in itself as a Sunday lunch affair for the whole family, to be followed by an afternoon nap. Börek is a special-occasion food which requires great skill and patience, unless you have thin sheets of dough already rolled out from your corner grocery store. Anyone who can accomplish this delicate task using the rolling pin , becomes the most sought-out person in their circle of family and friends. The sheets are then layered or folded into various shapes before being filled with cheese or meat mixes and baked or fried. Every household enjoys at least five different varieties of börek as a regular part of its menu. Next to bread, “pilav” is another staple in the Turkish kitchen. The most common versions are the cracked-wheat pilaf and the rice pilaf. A good cracked-wheat pilaf made with whole onions, sliced tomatoes, green peppers sauteed in butter, and boiled in beef stock is a meal itself. Many versions of the rice pilaf accompany vegetable and meat dishes. The distinguishing feature of the Turkish pilaf is its soft buttery morsels of rice which readily roll out from your spoon, rather than sticking together in a mushy clumps. “Kebap” is another category of food which, like the börek, is typically Turkish dating back to the times when the nomadic Turks learned to grill and roast their meat over their camp fires. Given the numerous types of kebabs, it helps to realize that you categorize them by the way the meat is cooked. The Western World knows the “sis kebab” and the “döner” introduced to them mostly by Greek entrepreneurs, who have a good nose for what will sell! Sis kebab<Picture: Sis Kebab> is grilled cubes of skewered meat.Döner kebab is made by stacking alternating layers of ground meat and sliced leg of lamb on a large upright skewer, which i slowly rotated in front of a vertical grills. As the outer layer of the meat is roasted, thin slices are shaved to be served. There are numerous other grilled kebabs beside those cooked in a clay oven. It should be noted that the unique taste of kebabs are due more to the breeds of sheep and cattle, which are raised in open pastures by loving shepherds, than to special marinades and a way of cooking. Therefore, you should stop at a kebab restaurant in Turkey to taste the authentic item. “Kebabci” is by far the most common and the least expensive type of restaurant, ranging from a hole in the wall to large and lavish establishments. Kebab is the traditional Turkish response to fast food that is at the same time not especially bad for you. A generic kebabci will have “lahmacun” (meat pide) and “Adana” (spicy skewered ground meat, named-after the southern city where the the dish was born), salad greens with red onions and baklava to top it all off. Beyond that the menu will tell you the speciality of the kebabci. The best plan is to seek out the well-known ones and to try the less spicy types if you are not used to kebab. Once you develop a taste for it, you can have inexpensive feasts by going to the neighbourhood kebabci anywhere in Anatolia. “Izgara”-mixed grilled meat, it is how main course meat dishes are prepared at a meat restaurant. Mixed grills are likely to include lamb chops, “köfte”, or “sis” (select cubes of meat). The way of preparing ground meat will be the “köfte”. These are grilled, fried, oven-cooked or boiled, after being mixed with special spices, eggs, and grated onions and carefully shaped into balls, oblongs, round or long patties. Another popular dish, inspired by the nomadic Turks who carried spiced, raw meat in their saddles, and known to Europeans as “steak Tartar”, is the raw köfte. Here, it is made of raw, double ground meat, by kneading it with thin bulgur and hot spices vigorously for a few hours. Then bite-sized patties are made, and served with chilantro, known for its stomach-protecting qualities. Some restaurants specialize only in grilled meats, in which case they are called meat restaurants. The fare will be a constant stream of grilled meats served hot in portions off the grill, until you tell the waiter that you are full. The best one is Beyti in Florya, Istanbul, and the best way to get there is to take the commuter train from Sirkeci, the main train station on the European side, rather than negotiating the highway traffic. This way you can also see the local folks, especially the kids who seem to use the train to the fullest, carrying out their summer holiday adventures involving fishing and possibly a variety of other mischief. A whole class of vegetables is cooked in olive oil. These dishes would be third in a five-course meal, following the soup and a main course such as rice or börek and vegetable’meat, and before dessert and fruit. Practically all vegetables, such as fresh string-beans, artichokes, root celery, eggplants, pinto beans, or zucchini can be cooked in olive oil, and are typically eaten at room-temperature. So they are a staple part of the menu with variations depending on the season. Then there are the fried vegetables, such as eggplant, peppers or zucchinis, that are eaten with a tomato or a yogurt sauce. In addition to these general categories, there are numerous meat and vegetable dishes which feature unique recipes. When talking vegetables, it is important to know that the eggplant (or aubergine) has a special place in the Turkish Cuisine. This handsome vegetable with its brown-green cap, velvety purple, firm and slim body, has a richer flavour than that of its relatives found elsewhere. At a party, a frustrating question to ask a Turk would be “How do you usually cook your eggplant?”. A proper answer to this question would require hours! Here, too, it will have to suffice to mention two eggplant dishes that are a must to taste. In one, the eggplant is split lengthwise and filled with a meat mix. This is a common summer dish, eaten with white rice pilaf. The other one is “Her Majesty’s Favourite”, a delicate formal dish that is not easy to make but well worth trying. The name refers to Empress Eugenie, the wife of Napoleon III, who fell in love with it on her visit to Sultan Abdülaziz. To taste these dishes, look for a “Lokanta”. Borrowed from the Italian “Locanda”, this type of establishment traditional cooking prepared most usually for those who work nearby. The best examples are the Borsa, Hacì Salih, Konyalì in Istanbul and Liman and Ciftlik in Ankara. The tables are covered with white linen, and the menu comprises soups, traditional main dishes and desserts, including fresh fruit. Businessmen and politicians frequent visit these places for lunch. In Turkey, despite the Islamic prohibition against wine and anything alcoholic, there is a rich tradition associated with liquor. Drinking alcoholic beverages in the company of family and friends at home and in taverns, and restaurants, is a part of special occasions. Similar to the Spanish tapas, “meze” is the general category of dishes that are brought in small quantities to start the meal off. These are eaten, along with wine or more likely with “rakì”, the anise-flavoured national drink of Turks sometimes referred to as “lion’s milk”, for a few hours until the main course is served. The bare minimum meze for raki are slices of honeydew melons and creamy feta cheese with freshly baked bread. Beyond these, a typical meze menu includes dried and marinated mackerel, fresh salad greens in thick yogurt sauce with garlic, plates of cold vegetable dishes cooked or fried in olive oil, fried crispy savoury pastry, deep fried mussels and calamaris served in sauce, tomato and cucumber salad, and fish eggs in saucee. 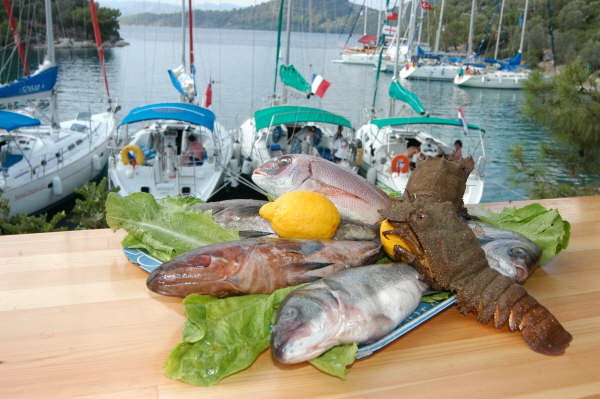 The main course that follows such a meze spread will be fish or grilled meat. When the main course is kebab, then the meze spread is different. In this case, several plates different types of minced salad green and tomatoes in spicy olive oil, mixed with yogurt or cheese, “humus” chick peas mashed in tahini, bulgur and red lentil balls, “raw köfte”, marinated stuffed eggplant, peppers with spices and nuts, and pickles, are likely to be served. Four seas (the Black Sea, Marmara Sea, the Aegean, and the Mediterranean) surround the Turkish landscape, and residents of the coastal cities are experts in preparing their fish. However, the best of the day’s catch is also immediately transported to Ankara, where some of the finest fish restaurants are located. Winter is the premium season for eating fish. That is the time when many species of fish migrate from the Black Sea to the warmer waters and when most fish reach their mature sizes. So, the lack of summer vegetables is compansated by the abundance of fish at this time. Every month has its own preferred fish along, with certain vegetables which complement the taste. For example, the best bonito is eaten with arugula and red onions, blue fish with lettuce, turbot with cos lettuce. Large bonito may be poached with celery root. Mackerel is stuffed with chopped onion before grilling, and summer fish, which are younger and drier, will be poached with tomatoes and green peppers, or fried. Bay leaves always accompony both poached and grilled fish. Grilling fish over charcoal, where the fish juices hit the embers and envelope the fish with the smoke, is perhaps the most delicious way of eating mature fish, since this method brings out the delicate flavour. This is also why the grilled fish and bread sold by vendors right on their boats are so testy. “Hamsi” is the prince of all fish known to Turks: the Black Sea people know forty one ways of making hamsi, including hamsi börek, hamsi pilaf and hamsi dessert! another common seafood is the mussel-eaten deep fried, poached, or as a mussel dolma and mussel pilaf. Along the Aegean, octupus and calamary are added to the meze spread. The places to taste fish are fish restaurants and taverns. Not all taverns are fish restaurants, but most fish restaurants are taverns and these are usually found on the harbours overlooking the sea. The Bosphorus is famous for its fisherman’s taverns, large and small, from Rumeli Kavagi to Kumkapi. The modest ones are small with wooden tables and rickety wooden chairs, nevertheless they offer delicious grilled fish. Then there are elaborate, fashionable ones in Tarabya and Bebek. The fish restaurants have always an open-air section taking up space right by the sea; the waiters run back and forth between the kitchen, perhaps located within the restaurant accross the street, and the tables on the seaside. After being seated, it is customary to visit the kitchen or the display to pick your fish and discussed the way you want it to be prepared. The price of the fish is also disclosed at this time. Then you swing by the meze display and order the ones you want. So the evening begins, sipping raki in between samplings of meze, watching the sunset, and slowly setting the pace for conversation that will continue hours into the night. Drinking is never a huuried, loud, boisterous, or a lonely affair. It is a communal, gently festive and cultured way of entertainment. In these fish restaurants, a couple of families may spend an evening with their children running around the restaurant after they are fed, while the teenagers sit at the table patiently listening to the conversation and occasionally participating, when the topic is soccer or rock music. The most well known sweets associated with the Turkish Cuisine are the Turkish Delight, and the “baklava”, giving the impression that these may be the typical desserts eaten after meals. This is not true. First, the family of desserts is much richer than these two. Secondly, these are not typical desserts as part of a main meal. For example, baklava and its relatives are eaten usually with coffee, as a snack or after a kebab dish. Let us now look at the main categories of sweets in the Turkish Cuisine. <Picture>By far, the most common dessert after a meal is fresh seasonal fruit that acquire their unique taste from an abundance of sun and old-fashioned ways of cultivation and transportation. Spring will start with strawberries, followed by green cherries and apricots. Summer is marked by peaches, watermelons and melons; then, all kinds of grapes ripen in late summer, followed by green and purple figs, plums, apples, pears and quince. Oranges, mandarin oranges, and bananas are among the winter fruits. For most of the spring and summer, fruit is eaten fresh. Later, it may be used fresh or dried, in compotes, or made into jams and preserves. Among the preserves, the unique ones to taste are the quince marmalade, the sour cherry preserve, and the rose preserve (made of rose petal). The most wonderful contribution of the Turkish Cuisine to the family of desserts, that can easily be missed by casual explorers, are the milk desserts – the “muhallebi” family. These are among the rare types of guilt-free puddings made with starch and rice flour, and, originally without any eggs or butter. When the occasion calls for even a lighter dessert, the milk can also be omitted; instead, the pudding may be flavored with citrus fruits, such as lemon and orange. The milk desserts include a variety of puddings, ranging from the very light and subtle pudding with rose-water to the milk pudding with strands of chicken breast. Grain-based desserts include baked pastries, fried yeast dough pastries and the pan-sautéed desserts. The baked pastries can also be referred to as the baklava family. These are paper-thin pastry sheets that are brushed with butter and folded, layered, or rolled after being filled with ground pistachios, walnuts or heavy cream, and baked. Then a syrup is poured over the baked pastries. The various types, such as the sultan, the nightingale’s nest, twisted turban differ according to the amount and placement of nuts, size and shape of the individual pieces, and the dryness of the final product. The “lokma” family is made by frying soft pieces of yeast dough in oil and dipping them in a syrup. Lady’s lips, lady’s navel, vizier finger are fine examples. “Helva” is made by pan-sautéing flour or semolina and pine nuts in butter before adding sugar, milk or water, and briefly cooking until these are absorbed. The preparation of helva is conducive to communal cooking. People are invited for “helva conversations” to pass the long winter nights. The more familiar tahini helva is sold in bloks at a corner grocery shop. Another dessert that should be mentioned is a piece of special bread cooked in syrup, topped with lots of walnuts and heavy cream. This is possibly the queen of all desserts, so plan to taste it at the Ikbal Restaurant on the Ankara-Izmir highway at Afyon. There are shops where baklava, börek, or muhallebi are sold, exclusively or in combination. People come to these places for take-away or to sit down at one of the few tables tucked in a corner of the store. The baklava stores usually feature also “water börek”, an especially difficult börek to make. Most börek shops also make milk puddings. These are excellent places to eat breakfast or lunch at any time of the day, since the regular restaurants may stop serving at two o’clock in the afternoon. Many pudding shops also serve chicken soup. In any event, it is possible to feast on börek and milk pudding for an entire holiday, if on a tight budget. Perhaps the most well-known shop of this type is Saray on Istiklal street in Beyoglu-Istanbul, in addition to the entire village of Sariyer on the Bosphorus. You have to be in Turkey to get the real and the best taste of the above desserts. However, in addition to the variety of Turkish Delights, there is a lesser-known type of dessert that can be taken back home in a sweet box. These are nut pastes-marzipan made of almonds and pistachios. The best marzipan is sold at the tiny, unassuming shop at Bebek in Istanbul. A few boxes usually will last for a month or so and bring delight after dinners. Finally, candied chestnuts, a speciality of Bursa, are among the most wonderful nutty desserts. Tea, on the other hand, is the main source of caffeine for the Turks. It is prepared in a special way, by brewing it over boiling water and served in delicate, small clear glasses to show the deep red colour and to keep it hot. Drinking tea is such an essential part of a working day, that any disruption of the constant supply of fresh tea is a sure way to sacrifice productivity. Once upon a time, so the story goes, a lion escaped from the Ankara Zoo and took up residence in the basement of an office building. It began devouring public servants and executives. It even ate up a few ministers of state and nobody took notice. It is said that a posse was immediately formed when the lion caught and ate the “tea-man”, the person responsible for the supply of fresh tea! Among the beverages worth mentioning are excellent bottled fruit juices. But, perhaps the most interesting drink is “boza”, traditionally sold in neighbourhood streets by mobile vendors on a winter night. This is a thick, fermentated drink made of wheat berries, to be enjoyed with a dash of cinnamon and a handful of roasted chick-peas. Boza can also be found year-round at certain cafes or dessert shops. Finally, “sahlep” is a hot drink made milk and sahlep powder. It is a good remedy for sore throats and colds, in addition to being delicious. Most of the first time voyagers are curious about the quality and variety of the food served on board our yacht charter we always have a captain, a cook and a deckhand and depending on the size of the vessel there are one or two stewardesses, when you choose a yacht charter with us, you may choose the menu and the food that you would like to be served and our chef is responsible to prepare them for you with utmost pleasure. Generally speaking there are breakfast, lunch and at 5 oclock tea time, coctail time and in the evening a dinner being served on board. 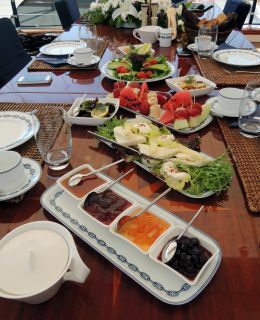 for example in the morning a rich Turkish breakfast would be served. Lunch is preferably mediterranean dishes with olive oil and fresh vegetable with salads then about 17H00 some cookies or Turkish pastry would be served together with tea or coffee and before the dinner you might enjoy some light entries while sipping your favourite coctail. Dinner would be fish, chicken or red meat of your choice.